I was 26 years old when I was invited by Leni Tiongco-Paderanga from the Executive Development Academy to join the Philippine Marketing Association (PMA) in 1988. It was the beginning of a series of transformations I went through that especially shaped my views on life, on pursuing excellence, on paying forward, and on making a difference. Just a year before that, I received a death threat after catching a salesperson in my office not remitting collection. Strangers were calling my home and office to “scare” me, and my worried family urged me to be careful and to protect myself to the extent that I had a bodyguard and had to carry a small Walter TPK (just like the one used by James Bond). I clearly did not like how that period of my life felt and it sort of forced me to do a lot of reflection on the kind of life I wanted to live. Yes, at 25 years old, I felt like an old, old soul. On my first year, I was immediately appointed by PMA as category chairman of the Agora Awards, dubbed the 'Oscars Awards' for marketing. The following year, I was appointed committee chairman for membership and was elected a director in 1990. As director I was in charge of youth and academe, and that was when my understanding of the needs of the academe was formed and inspired my company's (www.mansmith.net) series of scholarship to 25 full time marketing professors annually since 1997. I love PMA! It was the first professional organization I joined. I have fond memories of initiating events with fellow members which have been institutionalized to date -- The TOMAS award (acronym for Ten Outstanding Marketing Students) was a result of a realization that there are many marketing student leaders who should be recognized and a recognition from PMA will give them headstart advantage in their marketing careers. It was launched in 1990 and Mylene Abiva of Felta was the first chair for the expanded award. This has been eventually rebranded the Agora Youth Awards. TOMAS came with a twin award – the TOSMA award (Ten Outstanding Student Marketing Associations) to encourage junior marketing associations (JMAs) to have best examples of teamwork, collaboration and school pride. The 5-year PMA-Abenson Medal was also set up in 1990, awarding medals to presidents of JMAs of each school during their graduation. Another PMA program I launched was the first large scale Marketing Exhibit in 1991 at the Harrison Plaza. Sun Life's Erly de Guzman, then with Avon, was the first chairperson. An institutional category, that of Marketing Company of the Year, was added to the Agora Awards in 1991 and has since become the 'star' of the Agora Awards. I was also involved in various National Marketing Conferences (NMC) of the PMA. The NMC of the year 2000 was most memorable. I was approached and given full power by the PMA Board to turnaround the NMC despite my not being part of the PMA board anymore. The 1997 Asian Financial Crisis changed the knowledge needs of companies, thus the need to challenge assumptions and change agenda. Mansmith and Fielders Inc. was proudly the official program consultant. 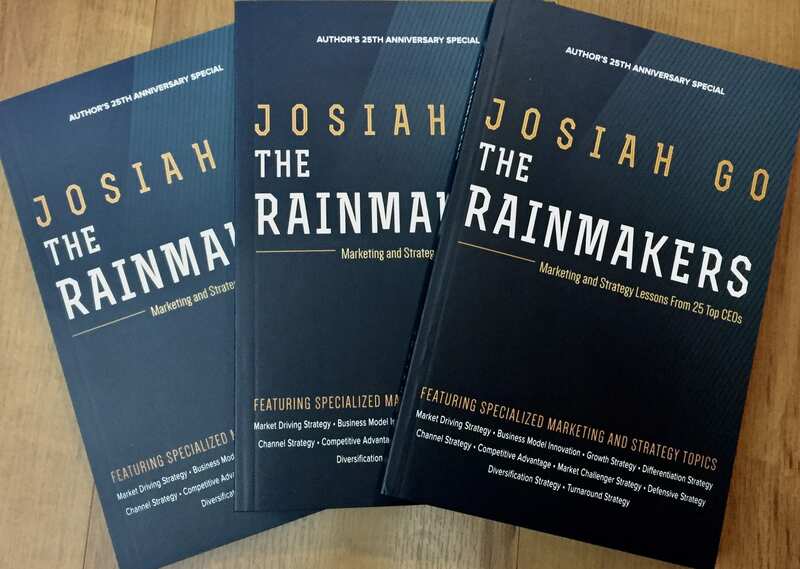 The agenda written by Mansmith became the outline of another PMA best-selling book 'Marketing Shift: From Basics to Breakthroughs' (edited by Josiah Go) complementing the earlier 'Marketing Excellence in Good Times and Bad' (by Jose Faustino, Josiah Go and Ned Roberto, 1998). To this day, the NMC of year 2000 became the most well-attended (all marketing efforts had to be stopped three weeks before conference date) despite a 30% price increase, which helped it to become the most profitable NMC ever as well, thanks to a supportive board and a very lean team of competent volunteers. The PMA this year, under President Henry Tenedero and Director Alpha Allanigue, is re-launching the Agora conference on October 21, 2015 with an all-Agora-awardee cast as speakers. It’s been over a decade since the last Agora Conference was organized, and this year’s conference promises to be “more intense, more intimate, more in-depth, and more inspiring”. See you there.